This year marked my first London Book Fair, and the event's last time at Earls Court before it moves to Olympia next year. London Book Fair 2014 was three days of being incredibly, incredibly busy, but also three days of fun. My first day started super early, and finished super late. 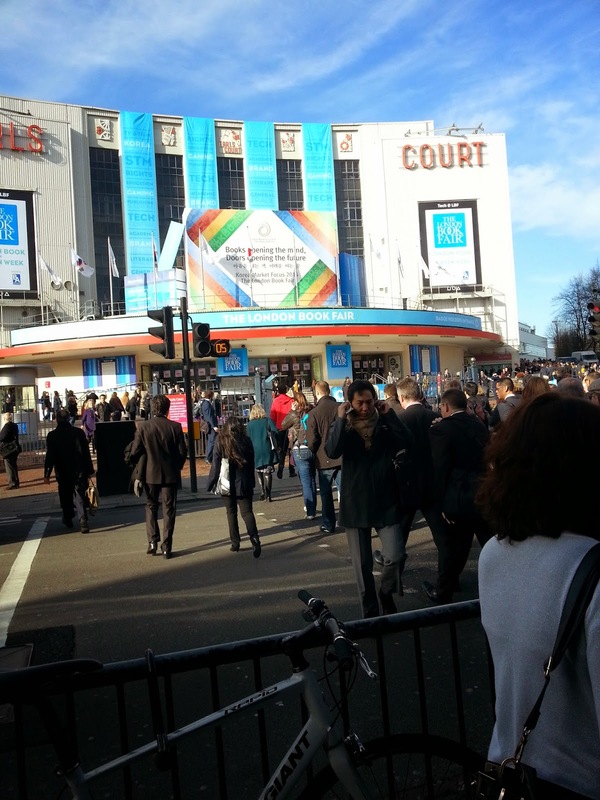 The above picture was taken before 9am on Tuesday, the first day of the book fair, and thousands of people were already making their way to Earls Court. The press room we were in was tiny and had no windows, and was pretty airless and hot, but it was all ours. Above is a selection of the food we worked our way through on day one. 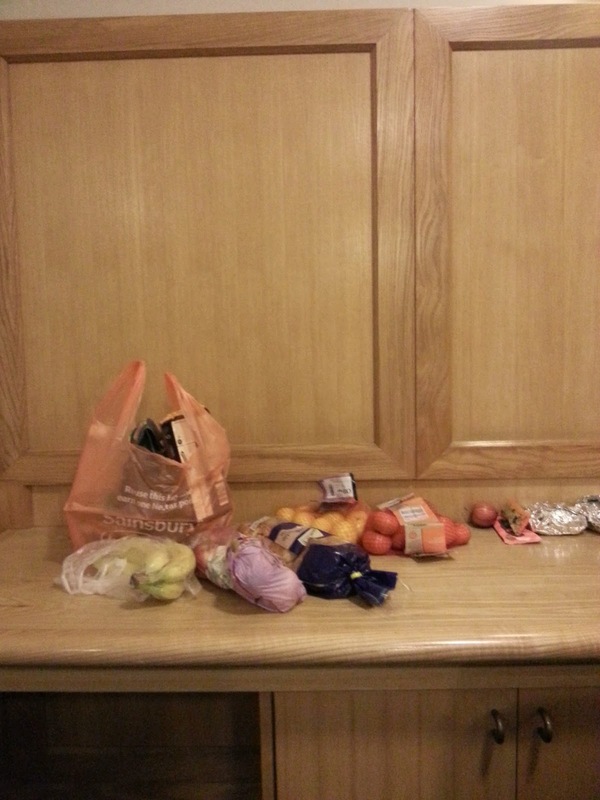 I spent two days eating unhealthily (despite the fruit you see at the front) and gained the weight to prove it! 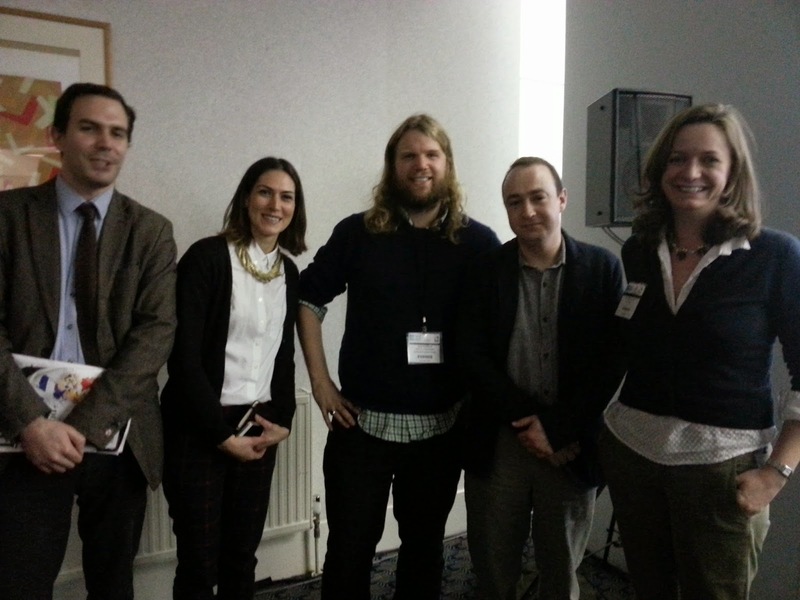 The company I work for put out a magazine a day about the fair, so the first seminar I went to featured the above panel (L-R Prospect's Adam Bowie, Rightster's Sophia Scleparis, Penguin Random House's Dan Franklin, Foyles' Jonathan Ruppin and author Harriet Evans) and was all about marketing books. The room was packed, with people having to sit on the floor, and it was a pretty good discussion. I spent a lot of time at the book fair running around the International Rights Centre (IRC), which is where all the deals are done. 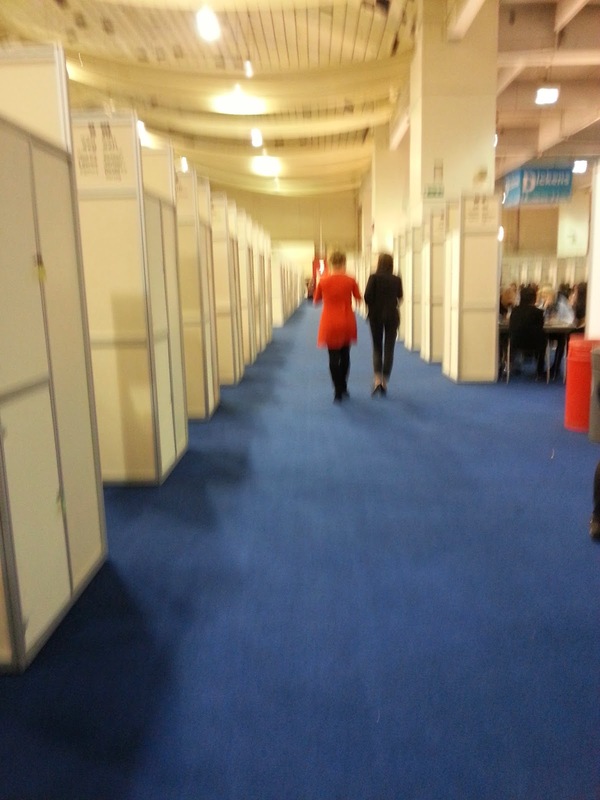 The centre (on the floor above the main book fair) consists of rows and rows of tables where agents and rights directors have meetings to try and sell their books. It looks kind of boring (above), and while it may seem like it's more fun downstairs where thousands of people hanging around, the IRC is where the main action happens. On the first day of the book fair, I spent my evening at a dinner for Deon Meyer, a South African crime writer. Hosted by his publisher Hodder, the dinner was held at The Zetter Townhouse near Farringdon. 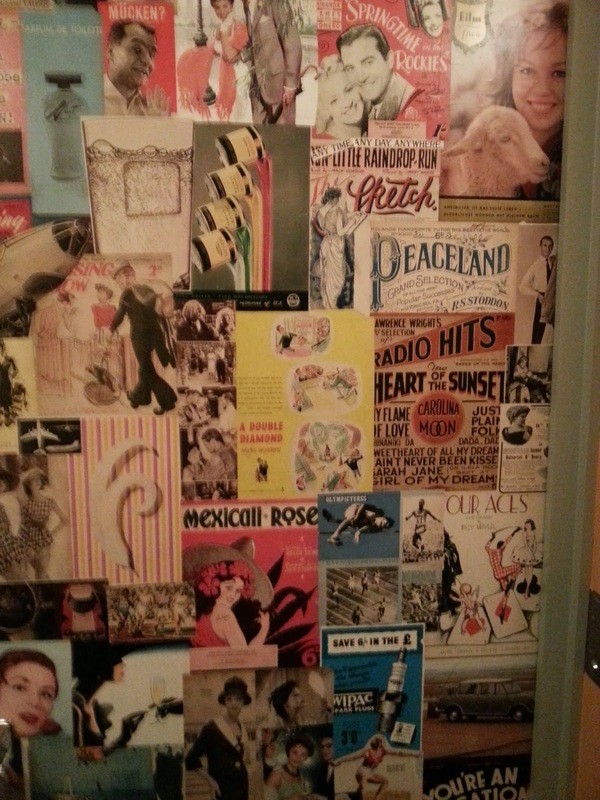 Above is a picture of the wall of the ladies' toilet. Meyer was absolutely lovely, and I had a brilliant time. 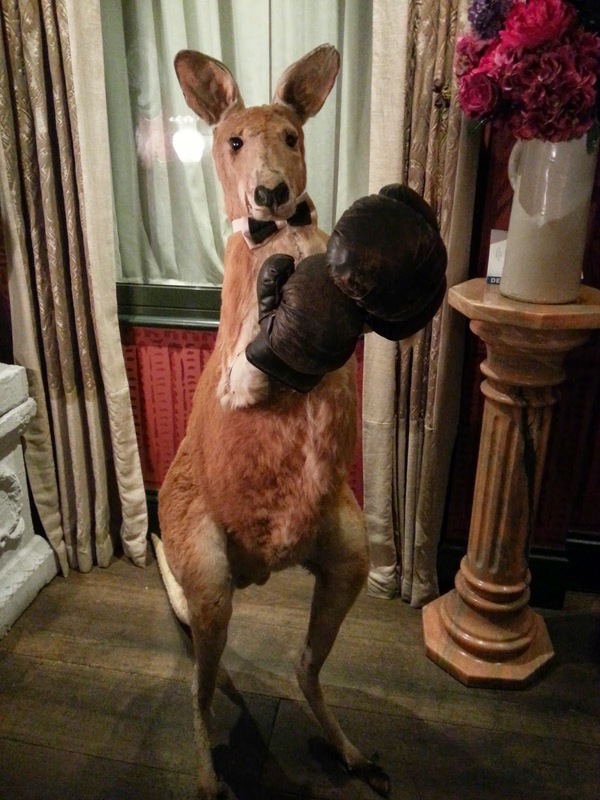 Aside from the people invited to the dinner, we were also accompanied by the above stuffed boxing kangaroo, which hung out in the room we were eating in. On Wednesday someone showed me a shortcut up to the IRC, which was great because it meant I could skip the crowded escalators and just run up the stairs from the press room. I paused for a couple of minutes to take a photo of the main exhibition floor. You can see a few of the massive stands, and if you look in the top right hand corner, you can see Hachette's stand, which was the only one on two levels. On Wednesday evening I went to Bloomsbury's illustrator evening, held at the company's offices. 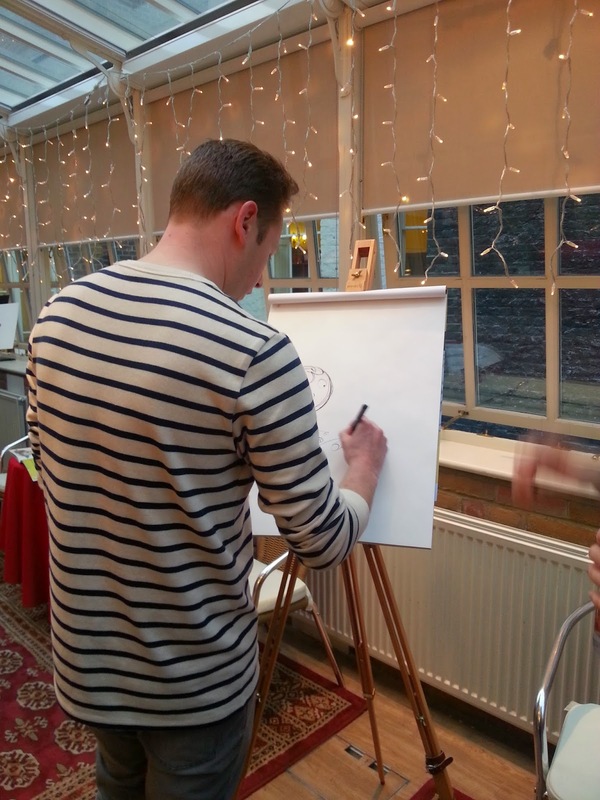 They had a bunch of their illustrators there showing off their skills, which are considerable and awe-inspiring. Above is Tom McLaughlin, whose book is The Story Machine. He was incredibly talented, and even his "bad" stuff was stunning. Bloomsbury gave us fantastic goody bags which included signed prints from one of their illustrators. 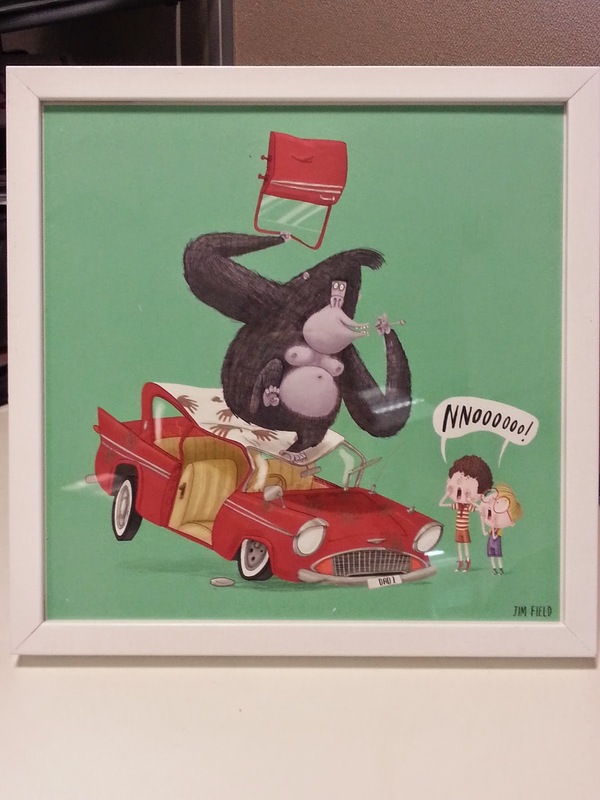 My print was by Jim Field, from the book There's a Lion in my Cornflakes (which is hilarious). It's now sitting proudly on my desk at work. On Thursday afternoon I headed back to the book fair for a quick wander round, and I've mostly spent the days since then recovering and catching up on sleep. 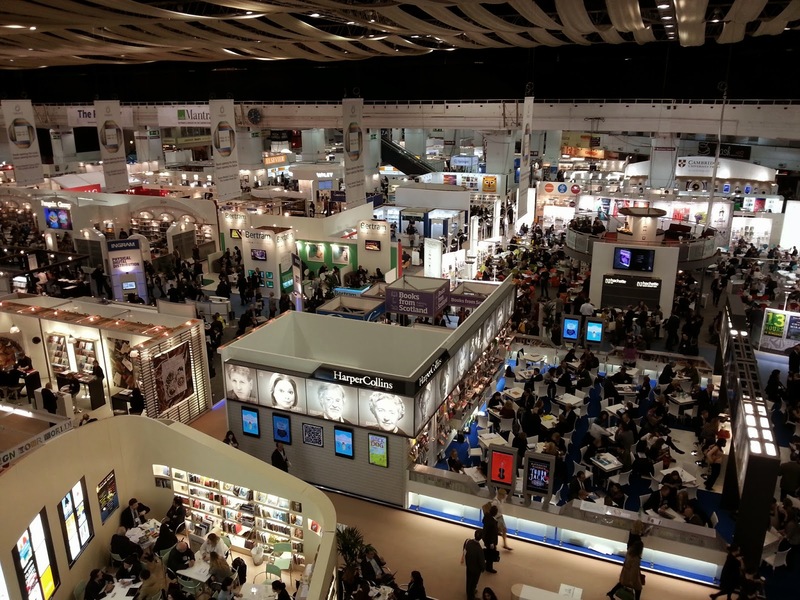 Here's to the 2015 London Book Fair! I know! All the illustrators were so talented, I had a hard time picking the picture I wanted. I think upstairs was where the business was happening, so it doesn't look like much fun. Glad you had a good time in London. I'm still shattered from the fair, so can only imagine how tired you must be when you add in all the extra stuff you did plus the travelling! I love conventions soooo much! I am going to the San Diego Comic Con in July and am super excited. I love the pictures you shared. I would really like to go to a book convention someday. Hopefully not in the too far future! Comic Con?! I'm super jealous, I've wanted to go for years, but alas, I live on another continent! I hope you share your experience, I'd love to read about it and live vicariously through you!